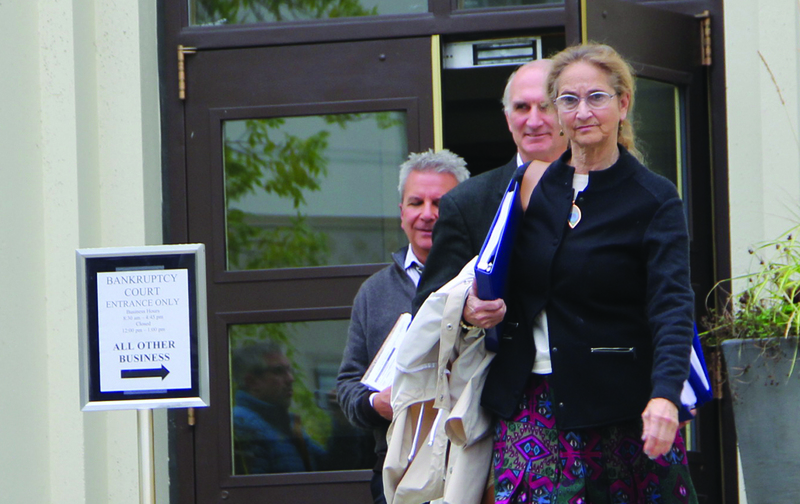 The long-running bankruptcy case filed by former Alaska Dispatch News owner Alice Rogoff might be near an end after the public trustee found grounds for an official complaint of wrongdoing against her and all parties agreed to go into a mediation set for June 4 in Anchorage. The purpose of the settlement conference is to find a resolution of the case without further litigation “by providing a forum for private and informal discussions,” according to a filing May 10 issued out of the U.S. Bankruptcy Court for the Eastern District of Washington. It’s a process that promises Rogoff little public exposure in a look at her financials or how much income she received that was not parceled in with the newspaper’s holdings. “Prior to the settlement conference, each party is to e-mail their confidential statement of position,” wrote Judge Frederick Corbit, of U.S. Bankruptcy Court for the Eastern District of Washington. Afterwards, all the documents will be destroyed, he wrote. The case remains in the U.S. Bankruptcy Court, Alaska Division, explained Christine Tobin-Presser, an attorney in the Seattle law firm of Bush Kornfeld LLP, who represents the public trustee. The mediator who agreed to oversee the process just happens to be out of Spokane, the Eastern Washington District of the U.S. Bankruptcy Court, she said. These moves indicate a settlement may be near. Rogoff originally filed for Chapter 11 bankruptcy reorganization on Aug. 12 before selling the Alaska Dispatch News to the Binkley Co. for $1 million on Sept. 11, 2017, after she purchased it in 2014 for $34 million from McClatchy Co. Under Binkley ownership, the historic daily newspaper was then changed back to the Anchorage Daily News. (The Binkley Co. has since acquired the Alaska Journal of Commerce in a deal that closed Feb. 23). The bankruptcy was converted to Chapter 7 liquidation later in September to pursue assets that could be used to pay those still owed money. As of the deadline on March 19, a total of 29 companies or individuals submitted claims for bills they say are owed them, a collective total of just less than $9 million. Rogoff listed herself as a creditor for up to $23 million owed. Nacole Jipping, a court-appointed public trustee, examined Rogoff’s finances to see how her financial decisions may have contributed to the bankruptcy. Jipping’s role is to recover any monies possible to repay the debts left behind, and if she found fault with Rogoff’s handling of finances that contribute to bankruptcy, her role calls for her to file that finding with the court. Whatever Jipping found as error on Rogoff’s part in her financial dealings isn’t publicly available because it was filed confidentially in court documents, Tobin-Presser wrote in an email response to a Journal question. Further, the complaint is still in draft form. “We have not filed the complaint. It is not public at this time,” Tobin-Presser wrote in an email. Confidentially claims on Rogoff’s part have played a big part in the plodding progress thus far in the case. Rogoff has maintained that her private finances are off-limits to this court examination in the manner that legally protects owners of limited liability corporations. How much she received through a 2005 separation and later, a 2017 divorce settlement with her former billionaire husband David Rubenstein is not “the court’s business,” her attorney James Lister has argued. In March, U.S. Bankruptcy Court Alaska Division Judge Gary Spraker ruled that Rogoff’s financial documents at Northrim Bank were not off limits. The bottom line of Spraker’s March 21 decision is that Rogoff’s finances are not confidential as it relates to the $13 million loan from Northrim Bank used to purchase the Anchorage Daily News from McClatchy Co. In mid-April, Lister submitted an appeal to the Ninth Circuit Court of Appeals bankruptcy section asking the court to decide on whether Spraker erred in his ruling. The 9th Circuit hasn’t yet agreed whether to hear the appeal, Lister said. The appeals question remains separate and could become moot, depending on the outcome of mediation, Tobin-Presser said. If the complaint against Rogoff is finalized, it would be available for public view, the attorneys said.